From the moment the flood of 2010 washed us together, the community of folks that have become Open Table Nashville have been committed to HOUSING, HEALING and HOPE through advocacy, relationships, and education (with a little agitation on the side to ensure everyone is paying attention). 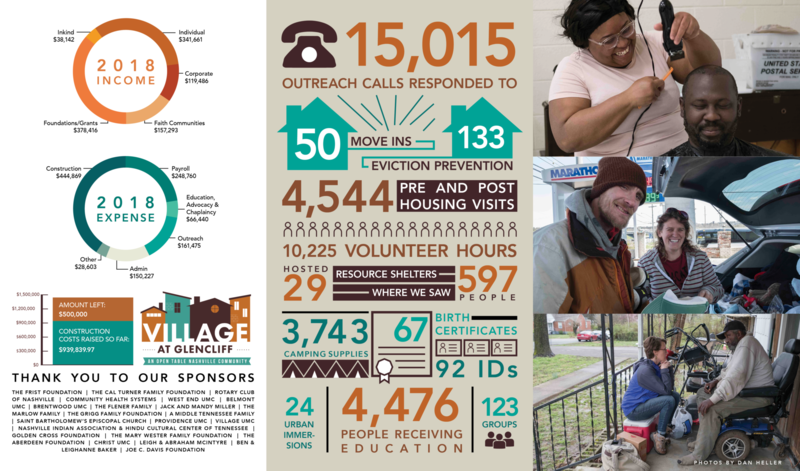 Knowing it takes every facet of our city to disrupt the systemic inequities and economic disparities we’ve accepted for far too long, Open Table Nashville has worked hard to build relationships throughout the city — collaborating with over 35 other homeless resource agencies, Metro government, communities of faith, corporations, civic organizations, and individuals. Because of you, we have the unique opportunity to serve our city from a rarely seen perspective with the special OTN twist that has created a compassionate community built on a strong commitment to the idea that we are all bound up in each others liberation. It is our greatest honor to learn from and walk alongside our friends, simply experiencing the cycles of everyday life together. Living without a home is a very different reality than most folks receiving this message. As we move into a new year, we give thanks for being able to serve our friends experiencing homelessness with flexibility, dignity, and urgency. We can only share such radical hospitality and love because of your generosity and support. We are eagerly awaiting the opening of our new medical respite/ bridge housing community, The Village at Glencliff, in early fall (all fingers crossed!). We will continue living into the struggle towards housing and Beloved Community for all people. We can do this. Together. When we are open to the “signs and wonders” revealed in life together, we are a giant step closer to that Beloved Community where there is room for each human at the table. If you’re interested in sustaining OTN by becoming a monthly donor or giving a one-time gift, we invite you to do so here. To view our detailed financials on GivingMatters.com, CLICK HERE.